The Bundle of Holding +4 is a collection of up to five indie tabletop RPGs in a name-your-price package that supports a couple of very worth charities. The fine tradition of the "pay what you want" bundle is alive and well in the world of tabletop RPGs, as seen in the new Bundle of Holding +4 collection. The bundle features three exciting indie RPGs - the sci-fi thriller Psi*Run, the historical witchcraft tale Witch: The Road to Lindisfarne and the Native American tales of How We Came To Live Here - available in whatever price you care to pay. And since you're well-versed in how these things work, it'll come as no surprise that paying more than the average will net you two bonus games: the "slapstick fantasy" Do: Pilgrims of the Flying Temple and the Apocalypse World-based Monster of the Week. You can divide your payments between the RPG authors, the keepers of the Bundle and charity, in this case Oxfam and Feeding America. Unlike a lot of tabletop RPGs, these promise to be easy to learn and quick to play, with full stories completable in a single session. The games come in DRM-free PDF format, and if more are added to the bundle, anyone who's already purchased it will get them free. If you're into the tabletop gaming thing, it's a pretty solid deal. 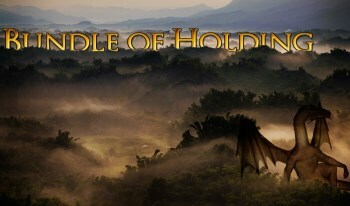 The Bundle of Holding +4 is live now and will be available until July 19. Check it out at bundleofholding.com.